How to use Lucky Mojo herb baths, crystal salt baths, and floor washes for cleansing, protection, love, health, and luck. I don't know about the orbs. I have no clue. Sometimes Spirits present themselves as orbs and that's what you might be seeing. But, sometimes it can also be an eye condition so I urge you to see an eye Doctor just to be safe. You wll know when its time to do another bathing ritual. You'll start to feel heavy. You will just know. The 13-herb bath always puts me in a little trance and I feel terrific. It takes a long time to do but is definitely worth it. I hope after uncrossing you brought in some "good" stuff, because when we take out we always have to bring back in. jwmcclin wrote: I would like advice on how often to take the herb baths...13 herb, 9 herb and 7 herb...is it advisable once a month, twice a year etc...I understand the importance of taking them periodically...but I would like advice on this question...Thanks. Frequency and type of bathing will depend on an individual's personal situation and needs. 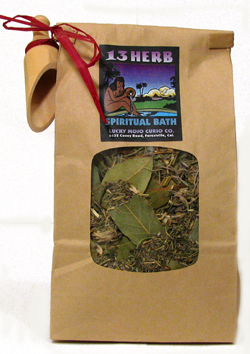 Many people need a 13 herb bath a few times a year to cut through whatever spiritual crud they may encounter going through life. But some folks are magnets to trouble, or may live in areas with high concentrations of trouble, or may be unfortunate enough to attract the enmity of someone with the ability to do ongoing negative work on them, and for these folks, a series of 13 daily 13 herb baths, followed by weekly 13 herb baths thereafter, may be what they need to keep themselves free of negativity and bad luck. Along a similar line, someone who gambles alot may want to take 7-herb baths on a regular basis, perhaps as part of that person's overall preparation for going out to gamble. 9 herb baths are often taken in a series of 9 daily 9 herb baths in support of personal mastery or success work. Is it possible for the " bad stuff " to still be on a person after a thorough cleansing? I was told earlier this year by an AIRR worker that my case may need constant cleansing. The AIRR worker saw some really nasty stuff on me and had suspicions that I may have stepped into some " mess ' through my journey in life. Hello this is my first time posting to this group. I have heard about this site before and I have one of Cat's books. I have the Herb and Root Magic. And of course several books by Scott Cunningham. Anyway, I'm not sure if I'm supposed to post this here but I need some advice on a few things. I was kind of heavy in Wicca/Witchcraft, I'd say about five years or so. I just kind of walked away from it, don't know why. Anyway since then that's when I started having problems. In 2011, two relatives died within six months of each other. One was sudden. Within two years I've had two car accidents, neither my fault and the one in 2014 could have been fatal. Both cars totaled. Another car repossessed and another car broken down (all black cars BTW). Bad luck with jobs (can't get and/or keep one). Relationship troubles (mother, so called friends and love life). Mental illness, custody issues, having to move abruptly because of the negative issues with my mother. And also I lost my father suddenly last year. That was two weeks before that potentially fatal car accident. I have problems sleeping most of the time because of stress. Memory problems and lack of concentration. The only good thing/s that has happened for me was I graduated college with a B.A. In Human Development and Family Studies. I want to eventually receive my Ph.D in Clinical or Cognitive Psychology. Or anything dealing with the brain and behavior. I am also interested in Neuroscience. But I can't get into graduate school. Even though I have turned to Buddhism and try to meditate-key word is try, I have a very hard time concentrating or even just getting time alone. My kids are well, teens now and good kids. All have very good goals and are working towards them. Besides school, it seems like that's the only real thing I've gotten right. I do see a therapist for my issues and I try to meditate, study Law of Attraction and things related to that matter and Buddhism but nothing seems to work. It's like everything slips through my fingers. And now my funds are limited: got cut in have because I lost my job. I know I have a lot of negative energy around me. Seems like it gets worse every year. I'm sorry this is such a book; I guess I'm reflecting. But I'm lost. Does anyone have any idea on what to do. I really just need to get rid of the negative energy and I think everything else will fall into place. Any suggestions are helpful. Thank you. I suggest the 13 day herb bath, the bag size. Also, I have included an article written by Miss Cat on bathing. 13 Herb Bath Break jinxes, end crossed conditions, dispel evil. Can I do the bath and reversing candle at the sametime? Hi. I recently did a 13 herb bath after laying down some goofer dust. I am curious. I did kind of take a bath with it because; really to stand or sit in a bath with no water; naked and reciting the 37th Psalm of David 13 x's takes FOREVER and your body does get soo cold!!! So I did take a bath with it in there and read after I rinsed downward each time. It took me almost an 1hr and 1/2 to complete. With kiddos; I don't have that much time to do a spiritual bath. So - my ? is this.. I did use some to wash the areas I worked at to make the goofer dust. I took some of the left over bath water to the crossroads; but when I went to dump it some splashed on my hand and talisman and leg. Will I need to repeat the process all over again or can I make some more 13 herb mixture and spray it on me instead. Or am I ok not to do anything else at all?? I noticed as soon as I got it on me; my stomach got all nervous and ached.. If you got sick to your stomach, then I suggest another bath. And try to dispose of it in a calm and concise manner. Yu might want to just go outside with regular water and practice how to do it without getting it on yourself. I think I am going to start to do this ritual again because I am not hearing from anyone that I know and I stopped having small wins with the lottery and scratch tickets. I just don't know if I should do the whole thing again or should I just bathe for one day? Does anyone have any advice for me? try the one day and see what happens. If there's still no luck, then do the full 13 days. I just ordered my 13 herb bath packet and I wanted to know if during the bath you have to dunk your head in the water or pour the water over your head? The reason I ask, having african-american hair it's hard to take care and its very delicate, so I was wondering if I can take some of the water and run it through my hair without having to completely immerse myself in it? Or can I pour the bath over my head while wearing a shower cap? Your opinion will be appreciated. I did the 13 Herb Spirit bath this evening and I will see what happens to me now. Maybe I do just need the one bath after doing the whole ritual a couple of weeks ago but who knows?- all I know that after I do this one bath I feel very strong and untouchable. I love the way I feel and I hope this feeling lasts. I'm about to start the 13 Herb Bath for 13 days but I go for a walk/run every morning for about 2 hours & will need a shower when I get home. Is it okay to do the bath at sunrise, go out for a walk or run at 6/6:30am, and then take a shower to get rid of the sweaty ickiness afterward? Sunrise is the time to take the bath, but it is also the best time for me to hit the trail. That sounds fine to me. By the time you are done running the 13 herb bath will have had time to dry on you. Sometimes when we don't listen to our feelings, "S" happens! But, this is now a good learning experience to listen. You'll do just fine the next time. I ike it when people do mess up because it is a life learning experience. Haha Ms. Aida, right you are! The way that it happened was very fortunate, at least. Within walking distance to my home & in front of a business that didn't call & have me towed at my expense. If it did have anything to do with the work, it was probably just the spirit world helping me to deal with it in the kindest way possible. You may want to consider an uncrossing. And do some protection spells as soon as possible. Hello, I want to start the 13 day herb bath tomorrow. I want to do the whole 13 days. It's a small packet. Can I boil a pinch of the herbs in a small pot of water everyday and add it to my bucket of bath water or boil all the herbs at once and keep the water for 13 days and add a bit of it to my bath water everyday? The questions aren't silly. We all wish you to be successful There isn't enough in the single use packet to stretch them for 13 days. 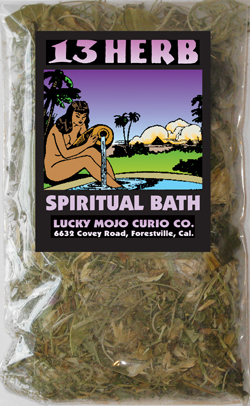 Lucky Mojo carries a 13 day supply of the 13 day herbal bath. When I do my spiritual bathing, I set the bible on the side of the bath tub, recite the psalm, & put the bath over my head as I'm finishing. I.e., I won't need to continue reading if I don't have the psalm memorized, & can be far enough from the bible in the tub to not splash it with the water. Thank you so much AlyssaH. One more question. Can I do this bath at 12 midnight everyday? This is when I take my bath before going to bed cuz I leave home early for work in the morning. Also, I can take this bath right after taking my actual shower right? Also, can I follow this bath with blockbuster spell or it's not necessary? Yes you can take it after the real shower, that is advised so you are wearing the bath all day. You can follow it with block buster after the 13 days yes, or I like is replacing the bad now with a good positive energy and take that bath for a few days like blessing or if doing love work then attraction, or generally van van. I have a quick question about the 13 herb bath. Can it be ingested? The short answer is - NO! What purpose would you have to consider that? She should seek medical attention asap.As for the bath call the shop to ask. I have started up using my 13 Herb Spiritual Bath again on Saturday because I am also almost finished doing work with the D.U.M.E glass encased fixed candle as well as finished up with the Fiery Wall of Protection spell kit, would you be able to tell me how long I should do the cleansing with my 13 Herb bath? I am also waiting for Hyssop products from you to get delivered to me as well. Well the ideal manner in which to use 13 Herb baths is to take them for 13 consecutive days, reading the appropriate psalms as well. You can get some good results from a single bath, but the best effects require the full 13 days. Thank You Miss Athena, because I only started back up with this on Saturday and then stopped I'm going to start everything over tomorrow doing it for 13 consecutive days because I just took a shower. It will be good to start this after I go bury the D.U.M.E candle in the lake. Thank You, wish me luck please. So I did start it back up again today and I will continue tomorrow but is it normal for it to make you feel quite drained after? I have been taking the 13 Herb everyday and today was the 7th day but I had some difficulties because I was out all day with appointments and so when I got back home I had to start my bath (which was a little late) and my mother who had come home from work was totally on my case about the bath and how she thought that it would block the drains (even though I strain all of the herbs out the bath). She just stressed me out and made it very difficult to for me to concentrate on the 37 Psalm. It was hard but I eventually got through reading it 13 times. I hope that her loudness yelling at me on the other side of the door didn't interrupt all of this cleaning work that I am trying to accomplish because I want to get clean and continue searching for somewhere else to live. Somewhere not living with anyone that already thinks I'm a arsonist that practices black magic. So do you think her yelling and behavior ruined it??? It's very weird when you do a cleansing like this and you leave your house to go outside and you still see people around you acting like punks- That's hard for me to understand. Well today was day 10 doing the 13 Herb spirit bath and I am quite drained from it. I am so drained that it is hard for me to get through the days with all of the stuff that needs to get done, then having to constantly watch my back in this racist neighborhood when I am walking my dogs but its even more difficult when I am looking forward to seeing my friends but then I cannot go because something dumb happens like all of the power in my house goes out so I can't leave my mother and dogs in this dark house with the security camera not working- which really broke my heart because I did want to see my friends but then couldn't. As Miss Aida said above, it is very common to feel drained when doing the full 13 herb bath. You need to take time to breathe and relax because it sounds like you are overwhelming yourself. This is a time to be calm and trust in the spell to clear away all negativity. Focusing on all that is negative in your surroundings won't help you. It also doesn't help to keep describing every step of your spell here, because you are just magnifying the messes you are experiencing. So use the time of your baths to pray, meditate, exhale and be still. Feel the water wash over you. It can be a cleansing experience in every sense of the word. Feeling drained afterward signifies the release of negativity. View it as a positive and hopefully you can start to change the narrative you are assigning to this experience. Thank You Miss Athena, I will do that because I do want to change this whole experience. I bathe my doll in a plastic container dunking him entirely as I read from the psalm. After each bath I rinse the container under tap water and put it away for the next day. Should I be cleaning the container with something stronger instead? Also plastic dolls can't air dry in a short period of time, so I would try to shake the water off the doll as much as I can and put him back into his bag with a bit of bath water still wet on him, is that ok? Please don't shake the doll. It's like shaking him. I posted in another thread about my difficulty swallowing food and how my health has deteriorated as a result and was advised to do a 13 day bath as well as burn some uncrossing incense. I have my 13 herb bath but I'm waiting on my incense burner to arrive in the mail before I start my cleansing. In the mean time I have a few questions that I would be eternally grateful for an answer to. 2) Is it ok to burn my candles on the floor beside my bath for me to walk though as my tub won't balance them on both sides of it. 3) Right now I'm not in the best shape at all so getting to a crossroads 13times would be hard for me so would a tree in my communal garden be ok to dispose of my bath water and candle wax once I'm done and do I also have to dispose of the strained herbs in the same way too. 4) finaly should I burn an increase b4 I start the first of 13 baths or after my 13th bath. I'm Sorry to ask all these questions but I have been suffering with this sickness now for months and I believe it may have been brought on by me not doing rituals correctly so I need to be 100% sure I'm doing the right thing so I don't make myself any worse. First of all, I am sorry to hear that you are not feeling very well. Have you consulted a medical practitioner about your illness? This is the first (and most important) thing to do, before turning to spiritual relief. I can answer your questions about your bath, but do please seek medical help first and foremost, if you have not already done so. 1. You can snuff out your candles and re-light them for the next night's bath. 2. Yes that is OK.
3. A crossroad is important as the water from your bath is symbolic of all the muck and negativity you are washing away from yourself. Pouring that out in a communal garden is like poisoning that garden. Please use a crossroad. 4. Uncrossing incense is a good thing to burn before your bathing ritual and again afterwards. It can't hurt. Good luck, I truly hope you start to feel better soon. Yes Miss Athena I have been admitted to hospital for numerous tests with no diagnosis so I'm going the spiritual route as a last resort. Ok then I will use the crossroads as you suggested, do I take the strained herbs with me too or can they be disposed of in the trash.1 last thing is it necessary to make a fresh batch of the herb bath daily or can I make a large portion to use on different days I read elsewhere that some people make enough for a few days store it in the fridge and then heat it up when ready to use. This site here is priceless to me as I live in the uk and there doesn't seem to be an abundance of hoodoo/conjure practitioners that are able to offer advice and understanding. You guys are doing a great job. GamesavyLB, I brew my 13 herb bath fresh everyday to make sure the tea is "alive" and also pray to the herbs as they steep. After the bath is done I add the strained herbs into the cup of bath water that I take to the crossroads to discard. I agree with Innocence, it is best to brew the tea for your bath every day. Disposing of the herb remains along with your bath water in a ritual fashion is appropriate. Tomorrow will be the last day of the 13 herb bath ritual for my ex. After it's all done, should I throw away the plastic container I've been using to bathe his doll in or can I clean it with ammonia and use as a regular food container from now on? Side note: I can't help noticing how delicious the 13 herb bath smells everytime I make it. I wish there was an edible version! Yes, you can wash out and reuse the container. We encourage everyone alive to reduce the amount of landfill trash they create by following the principles of Repair-Reuse-Recycle. We discourage the use of plastic because it is difficult and more costly to recycle than glass and if left unrecycled, it is more environmentally polluting than glass, which is basically inert. OK, I've read through 95% of this thread, and there is a lot of information here. Most of my questions were answered (or nearly answered) but I have 2 peculiar questions, that I'm sure hasn't been asked so here goes. 1) I live in a Metro area. Disposing of my water on the ground every day at the crack of dawn would have the police/security by my side in seconds. My question is can I collect the water in a disposable bottle (which I read was ok) and depose of the entire bottle w/o pouring the water on the ground? Or is the pouring part of the ritual? *And yes, I did see cat's answer above. But as you can see, my circumstances are a bit unusual. There are many ways to surreptitiously empty water in a crossroads. You could have the open container in one hand, bend down to pick something up with the other, and pour out your water that way. You could "accidentally" drop an open water bottle and spill the contents that way. You could simply turn the bottle upside down as you walk through the crossroads. It can be done, and police or bystanders wouldn't think anything of it. I think you're overthinking and this makes you worry unnecessarily. As for the bath, I would wait until you got home to do the spell properly. I'm an over thinker, what can I say. LOL! Thanks for the ideas, I'm also thinking over a sewer would be less conspicuous too. I see them often at crossroads. Thanks also for the advice. Yes I think I will wait. I don't want any interruptions. I'm guilty of of being an over thinker too lol but Would the said container or bottle be reusable to collect and dispose of the bath water and its contents for the duration of the 13 days or would it be contaminated and need to be thrown away in a normal trash can or something as it may return what you were trying to cleanse yourself from. Well I would assume it is fine to reuse. Because if you think about back in the day. They used whatever container they had, and they re-used it. They'd clean it first of course. Perhaps I'll swish some Florida Water around in it after each disposal. You could re-use it but you would need to dispose of it at the end as it will contain the remains of all the negativity you washed away. Hi. I've read the pages about the herb baths, but I'm still a little confused. Are you supposed to just pour the strained water over your head or do you add the strained water to a bathtub full of water THEN sit in it and pour it over your head/immerse yourself in the water? You said: "do you add the strained water to a bathtub full of water THEN sit in it and pour it over your head/immerse yourself in the water? "